Putting a multiliteracies framework at the center of the world language curriculum, this volume brings together college-level curricular innovations and classroom projects that address differences in meaning and worldviews expressed in learners’ primary and target languages. Offering a rich understanding of languages, genres, and modalities as socioculturally situated semiotic systems, it advocates an effective pedagogy for developing learners’ abilities to operate between languages. Chapters showcase curricula that draw on a multiliteracies framework and present various classroom projects that develop aspects of multiliteracies for language learners. A discussion of the theoretical background and historical development of the pedagogy of multiliteracies and its relevance to the field of world language education positions this book within the broader literature on foreign language education. 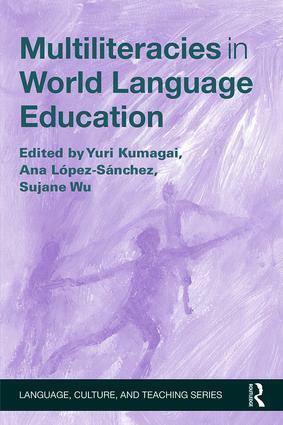 As developments in globalization, accountability, and austerity challenge contemporary academia and the current structure of world language programs, this book shows how the implementation of a multiliteracies-based approach brings coherence to language programs, and how the framework can help to accomplish the goals of higher education in general and of language education in particular. Yuri Kumagai is Senior Lecturer of Japanese in the Department of East Asian Languages and Literatures, Smith College, Massachusetts, USA. Ana López-Sánchez is Assistant Professor of Spanish, Haverford College, USA. Sujane Wu is Associate Professor of Chinese in the Department of East Asian Languages and Literatures, Smith College, Massachusetts, USA.